This baby animal has two furry ears, a long fluffy tail and tickly whiskers . She loves playing with her ball of wool, and likes having her tummy tickled! Join the dots to find out which friendly pet is hiding in the picture, then you can colour her in! 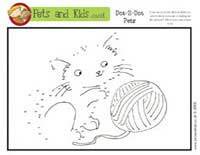 Why not Download the Dot to Dot Puzzle right now and see if you can guess the pet. This puzzle is aimed at 3 to 7 year olds, it's a fun way to teach children a little something about family pets, as well as helping with their drawing and problem solving skills.